AmeriMex Rx claims to be one-stop destination for affordable high-quality non-controlled medicines. The store is known for offering wide variety of medications, fast shipping, no online consulting fees that are some of the benefits of purchasing through an online store. Customers can find the medication of their choice from the wide range of medications and can easily place order. People planning to place order through this site must first check the online reviews and feedback of the pharmacy site, as placing order through this site may land them up into problems. Several reviews of AmeriMex Rx available on the Internet clearly indicates that the site has low level of trustworthiness and reliability and the site is also not considered to be safe for browsing, as the site neither provides privacy protection to users nor the child safety. PharmaciesReview.com has reviewed AmeriMex Rx o nesure that whether this pharmacy store is following pharmacy laws and practice standards or not. This pharmacy reviewer determined that customers need to be careful and cautious while shopping through this store, as most of the people do not had good shopping experience with this store. The customers need to check refund policy, shipping policy along with shipment and delivery before placing any order. According to the LegitScript reviews, AmeriMex Rx does not meet LegitScript Internet verification standards and is found to meet the definition of rogue Internet pharmacy. This further indicates that site violates Federal or State law and does not adhere to accepted standards of medicine or pharmacy practice. Scamadviser has reviewed the site and reported that the site may be risky and has given 39% trust score. This indicates that some of the customers had bad shopping experience with this site. Customers are recommended to avoid this pharmacy store because of the fact that they can get involved in Internet fraud or scam. As per the Scamvoid reviews the website has a poor trustworthiness and vendor reliability score in the Web of Trust reputation and customers are advised to avoid browsing the website. Providing any personal or financial information, while purchasing the medications may get them involved into identity theft risks, credit card fraud or spyware. 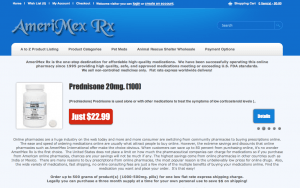 It is better to avoid this online pharmacy instead of getting cheated.